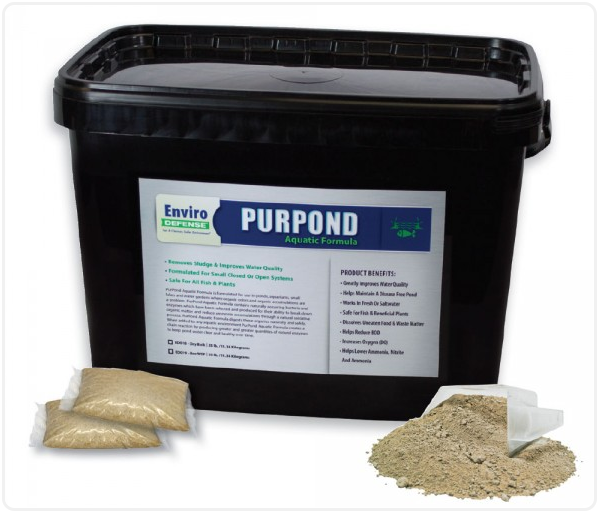 EnviroDEFENSE® PurPond Aquatic Formula is formulated for use in ponds, aquariums, small lakes and water gardens where organic odors and organic accumulations are a problem. EnviroDEFENSE® PurPond Aquatic Formula contains naturally occurring bacteria and enzymes, which have been selected and produced for their ability to break down organic matter and reduce ammonia accumulations through a natural oxidative process. EnviroDEFENSE® PurPond Aquatic Formula digests these organics naturally and safely leaving only water and carbon dioxide as a bi-product. Pond/Water Garden Application: Apply 1 oz. (29.57 ml) per every 1,000 gallons (3.78 L) of pond water. Start Up Application: Apply ½ Teaspoon (2.46 ml) per every 500 Gallons (1,893 L). Routine Application: Apply ¼ Teaspoon (1.23 ml) per every 500 Gallons (1,893 L). The graph below show the reduction of COD (measure of organic compounds in water) by strains in EnviroDEFENSE® PurPond Aquatic. As the substrate degraded, the % oxygen saturation decreases.